We’d love your help. Let us know what’s wrong with this preview of Troublemakers by Catherine Barter. Fifteen-year-old Alena never really knew her political activist mother, who died when she was a baby. She has grown up with her older half-brother Danny and his boyfriend Nick in the east end of London. No In three years I will be able to vote and I will still have less power than I did at the moment that I saw that email, which was such a tiny thing but look what happened. To ask other readers questions about Troublemakers, please sign up. I rarely read YA novels because I usually find them somewhat underwhelming, however Troublemakers is a contemporary coming of age story that well and truly lives up to its billing! In short, it is a superior example of this genre, driven by some well-fleshed out, bold characters and sparkles with humour, wit and spirit. Protagonist, fifteen-year-old Alena (Lena) Kennedy, has lived with her brother, Danny, and his boyfriend, Nick, in a flat in Hackney, East London, since she was three-years-old a I rarely read YA novels because I usually find them somewhat underwhelming, however Troublemakers is a contemporary coming of age story that well and truly lives up to its billing! In short, it is a superior example of this genre, driven by some well-fleshed out, bold characters and sparkles with humour, wit and spirit. Protagonist, fifteen-year-old Alena (Lena) Kennedy, has lived with her brother, Danny, and his boyfriend, Nick, in a flat in Hackney, East London, since she was three-years-old and her mother died. With twenty-years between Alena and Danny, together with Nick they have spent the last twelve-years in a stable family unit and Alena views both men as integral to her life, although it is Danny who is her legal guardian. Unflappable Nick runs an ethical coffee shop and is laid-back, patient and considerate. Danny, however, is almost his exact opposite, from his constant worrying about safety, providing a stable income through to his responsibility for setting a positive example for Alena. Despite both siblings having shared a mother in Heather Kennedy, Danny’s unresolved grief and anger sees him close down and refuse to be drawn when Alena suddenly starts to ask about their mother and her early years. But why are Danny’s memories so off-limits and why does Alena, even more worrying, have none of her own memories to treasure? Increasingly frustrated with Danny’s short-temper and attitude, Alena discreetly probes their mother's belongings that are kept in a storage locker and her industrious efforts on the internet see her uncover more about a woman she quickly comes to realise was a passionate and committed political activist. However the appearance of the “East End bomber”, a white man leaving a series of improvised explosive devices in the supermarkets around East London, sees the threat of terror encroaching on all their lives, with the unknown motive of the bomber fuelling hostility. As Danny starts to fret about keeping his family safe, it is his acceptance of a job working on the campaign of independent outsider for Mayor, the ultraconservative and vehemently right-wing, Jacob Carlisle, that sees the first cracks appearing in their harmonious household. As Nick’s animosity and his evident belief that Carlisle’s popularity surge is the result of his campaigns opportunistic pandering to citizens fears, Danny becomes public enemy number one in the flat. Combined with Alena’s political awakening, inspired by a mother she is slowly starting to idolise, when she finds herself presented with an opportunity to not only change the future of her city, but to transform her family life the fallout has the potential to alter everything. However, with two sides to every story, has she just destroyed everything that she valued and the only family unit that she can remember? And can she ever repair the life she once took for granted when, “everything about my life is different because what I thought I’d lost it turns out I never had.” Alena, is a slightly awkward intelligent teenager, a typical outsider in her school community where her and her two friends, Teagan and Ollie, are set apart by their individuality. They do their own thing, are mature and have well considered opinions, all with dramatically different situations at home to contend with, from Ollie’s missing brother, to Teagan’s overly keen to be involved parents. This should be required reading on the UK National Curriculum for its remarkably insightful commentary on just what living in a democracy means and why teenagers today should care and want to get involved. Compassionate, incredibly humorous with an emphasis on inclusivity and tolerance, Troublemakers is a clever and fascinating story that explores what family means to fifteen-year-old Alena Kennedy and the influence of politics on her unusual family unit. Barter does not limit the scope of this novel, which touches on unexplored grief and coming to terms and understanding our origins. As Alena comes to realise that Danny had her best interests at heart, her fierce intelligence sees her coming to understand and appreciate the many decisions that can change the course of a person's life along the way and the complicated world we live in. Undoubtedly the best YA novel that I have read in several years, showcasing a perceptive author who pitches this perfectly for an intelligent YA audience with a storyline that will give every adult serious food for thought. Troublemakers is an ambitious YA novel with real depth that considers everything from terrorist activity, morals and the many varieties of family life. From Greenham Common right through to the diverse community of London in 2017, this multi-layered novel is an utter joy to read and addresses it's readership with honesty and an appreciation of their capacity to quantify subjects that have formerly been considered adult territory. I don't tend to read contemporaries, I'm definitely a reader of science fiction and fantasy first and foremost. However, when I read the blurb for 'Troublemakers' I was intrigued. We're in a bit of a maelstrom in British politics, filled with the Brexit nightmare, racism, terrorism and general bigotry. We have a government that, honestly, can't quell their infighting, let alone look after the complex needs of an entire country. 'Troublemakers' is a book about a young girl's political awakening, but also about personal growth and values. Alena has, in many ways, grown up in a bubble of enlightened thought within her stable family unit of legal guardian elder brother, Danny, a journalist, and his partner Nick, who runs an ethical coffee shop. Hanging over her life is the spectre of her mother, a political activist who died when she was very young. Alena has been sheltered from the bigotry and hate of the world around her but the decision of her brother to take a job in the campaign team of a right wing mayoral candidate cracks that bubble right open. This book is very much a story about morals. Danny takes this job because of financial concerns, because he's terrified of not being able to care for his family, but in doing so he pushes his moral concerns to the side. Nick, a man who lives his entire life by his morals, is confused and abhorred by Danny's decision. Alena in the middle is trying to come to terms with what it all means for her. Alena's confusion sends her searching for the ghost of her mother, trawling through internet archives and finding mobile numbers for her old colleagues. Over it all lies the storage crate, a mythical entity to Alena which contains her mother's belongings and, maybe, her answers. The story asks a lot of questions about grief. About how Danny seems to have never really come to terms with his grief and Alena, because of that, has never been allowed to explore her feelings about her mother at all. There were parts of this story that were so emotionally raw that I actually cried. 'Troublemakers' is a really intense, nuanced and emotionally intelligent story. It captures the heart of London and it's diverse and sometimes slightly bizarre political landscape. It's a very well timed book in an era where youth are having to become increasingly politicised to allow their voices to be heard. I think one thing that it maybe skated over is social media's part to play in all of this. Alena, as a fifteen year old, would, without a doubt, be on social media and that would have a impact on the type of politics and views that she was engaging with. I think, from that perspective, it felt as if the story was taking place a couple of years ago, rather than in the up to date, very digital London that I know. This is a book filled with hope but also aching sadness. It's clever, astute, with an emotional clout that I wasn't expecting when I started to read it. I'd recommend it to young adults but also to older ones, because I think it's important that everyone remembers the weight their political decisions burden upon the youth of this country. Many thanks to Penguin Random House for a copy in return for an honest review. Review originally posted a Moon Magister Reviews. Oof, this book was honestly like a punch to the chest. Sad in an aching way, but with moments of blinding happiness and affirmation. I won this review in a Goodreads giveaway, in return for an honest review. I feel bad giving this book such a low rating. Everyone else seems to have really enjoyed it, but I found it frustrating. It was not at all what I expected from the blurb, which is not necessarily a bad thing, but it was also severely frustrating. While it was a good coming of age story, but with a non-conventional family and an accurate, teenage MC (read: highly annoying, with no ability to admit she's wrong). However, the whole book was just frustrating. The characters had holes, and came across as rather flat. The plot left a lot to be desired, and there was little overarching plot other than 'I want to know who my mother is and no one will tell me', paired with 'we all live slightly in fear of whoever is planting the bombs'. Instead, it felt like a series of side plots rolled together to make a story, but with the important absence of a true ending for most of them. Most of the side characters had entire plots that were only touched upon and never complete, despite having a fully built up line of suspense. Perhaps this was all just a metaphor for the fact life isn't wrapped up in tiny little parcels like a plot, but instead is made the whole book seem rather unsatisfying. Yes, okay, (view spoiler)[the bomber was inevitably going to be someone entirely unconnected, but there was no need for it to be just suddenly mentioned and then brushed over, without really allowing the reader or the characters to take it in (hide spoiler)]. Like nothing else I've read YA. I really enjoyed it and stayed up too late to finish it. I had high hopes for this book after hearing about it at Andersen's blogger event and I am so pleased to say it lived up to all expectations. What I liked about this book is that it is really different from all the other contemporary YA I've read. It is set in London and the focus of the story is looking at politics and morality around said politics. It's such a poignant story considering our current politica Like nothing else I've read YA. I really enjoyed it and stayed up too late to finish it. What I liked about this book is that it is really different from all the other contemporary YA I've read. It is set in London and the focus of the story is looking at politics and morality around said politics. It's such a poignant story considering our current political climate in a post brexit world where things feel like they are moving more to the extremes than ever before as people are losing hope in what seems to be an increasingly more broken system. I also really enjoyed the mystery elements to the story as Alena digs into the background of her mother who died when she was young and was involved in a lot of anti-government protests in the 80s but is rarely spoken about at home by her brother who raised her from when she was small. I loved finding out more about this absent character as the story unfolded. I also loved the insight the story gave the reader into what it means to be a family especially a less traditional one like Alena's. I thought it was particularly clever when it mused over the thoughts Alena has about her mother who died when she was so young and how that made Alena feel because she feels like she ought to actively miss her mother on one hand but finds it hard on the other hand to miss something she didn't really have. About halfway through this and it's lovely: well-rounded down-to-earth characters, lots of emotion, and themes typically untrodden by YA fiction. Tick-tick to teenage protag Alena getting interested in politics. Tick-tick-tick to Alena having shambolic-but-so-in-love gay dads. Political awakenings, unconventional families, and the most nuanced, relatable, realistic depictions thereof I've read in a while, shining with wit and honesty; a book I wish I could have read 15 years ago. Fantastic. Absolutely loved it. Totally apt for today's world. A loving, conflicted sibling relationship. A beautiful relationship. A complicated, yet simple political message. Character centric and I adored it. What a brilliant book. I read this in one sitting and it grabbed me from the first page. The voice, the setting, the plot - clever, clever, clever. Highly recommended. This is a book about wanting the best for your family and not always knowing if you're doing the right thing. It's about grieve. It's about emotions and talking about them. It's a good story and I was doubting if I would give it 3 or 4 stars, but I decided to give it 4 stars. Troublemakers by Catherine Barter (Andersen Press) is a political coming of age story about memory and the stories that ground us and bind us to our past and our families. It's beautifully written and had a place in my heart within the first few pages. 'In three years I will be able to vote and I will still have less power than I did at the moment that I saw that email, which was such a tiny thing but look what happened. Fifteen-year-old Alena never really knew her political activist mother, who Troublemakers by Catherine Barter (Andersen Press) is a political coming of age story about memory and the stories that ground us and bind us to our past and our families. It's beautifully written and had a place in my heart within the first few pages. Alena is a fantastic character walking that thin line between adolescence and adulthood and trying to find her balance. Barter has aced her thoughts and her uncertainties and her anger, doing a wonderful job of portraying Alena's struggle with her own self-awareness. She knows she is behaving like a brat but she embraces it and allows herself to be angry and to sulk and to argue her point. She is a fierce young woman and an awesome role model, flaws and all. 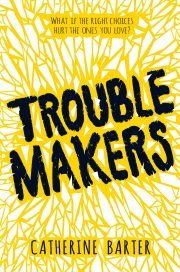 Troublemakers works as an introduction to political thinking for teens. Its storyline about integrity in political campaigning is something I don't recall ever coming across in a book before and something I wish I'd have read as a teen. I loved the beautifully casual inclusion within Troublemakers, but also that it doesn't shy away from talking honestly about homophobia and the fear of otherness and the way this fear is directly linked to the politics of our time. It doesn't preach but it does shine a light and suggests that there is another way, a better way to be. It is a hugely hopeful and inspiring book, encouraging our young people to expect better. To demand better. I was reading this book on my phone when the news app notifications told me of the Manchester bomb attack. It was the perfect book to help me through all the emotions I'm sure we all felt on that night and the days that followed. Perfect because reading this book was a little like having someone holding my hand and saying it's all going to be ok. Saying, 'yes, this world is messy and screwed up and life is hard and confusing but ultimately, the best thing we can do to combat that is to be the best version of ourselves and stand up in the face of it all and try and make the world a better place'. It is very much a book that celebrates individuality and the braveness of being yourself. It is warm and hopeful and truthful and just might change the world. I really enjoyed this character-driven story, it was refreshing and very different to other contemporary YA books I've read recently. The story was compelling and revealed bit by bit which makes you want to keep reading. Alena is a compelling character and very relatable. I love the way she knew when she was being unreasonable or over-reacting but she just found herself saying things she didn't mean - that felt very real to me. The dialogue was very well-written, especially between Alena and her I really enjoyed this character-driven story, it was refreshing and very different to other contemporary YA books I've read recently. The story was compelling and revealed bit by bit which makes you want to keep reading. It's a very well-written coming-of-age/identity story, and one I'd recommend to all fans of contemporary YA books. Loved this. This was very much a ‘slice of life’ kind of story where nothing really exciting happens, rather, everything is realistic, but I never found myself getting bored. Alena was a convincing teenage character that Barter got just right—she wasn’t unbelievably naive but she wasn’t annoyingly precocious either. She was curious like any other 15-year-old teenage girl, wanting to understand the politics of a society she lived in, but there was still a lot she had yet to understand. Danny and N Loved this. This was very much a ‘slice of life’ kind of story where nothing really exciting happens, rather, everything is realistic, but I never found myself getting bored. Alena was a convincing teenage character that Barter got just right—she wasn’t unbelievably naive but she wasn’t annoyingly precocious either. She was curious like any other 15-year-old teenage girl, wanting to understand the politics of a society she lived in, but there was still a lot she had yet to understand. Danny and Nick made it so much better. I loved the diversity of their family set-up—Danny and his boyfriend Nick raising his little sister together—and the fact that them being a gay couple wasn’t all there was to their characters and their roles, although homophobia was a theme that was still discussed. - The diversity and liberal thinking in Troublemakers was wonderful to read and it kept my interest up throughout as I was curious about how Barter was going to continue to present these characters in a complex way without going to stereotypes; she did it brilliantly! This makes Troublemakers easily one of my favourite books for how it displayed a variety of A book with more diversity than action which ultimately makes it a slow and quiet read a far cry from what the blurb seems to promise. - In a climate where there's a desperate push to engage young people in politics, I enjoyed the maturity of the protagonist's political dilemmas, although, that same maturity didn't make her feel like a very realistic teenager. Her depth of thought about politics clashes with her naivete about relationships and I feel that being very perceptive in one area would imply you are in the other. She didn't feel realistic or all that interesting. - I wanted this book to be written by Danny. Danny was the most interesting character and I was bored by a fairly easy-going coming-of-age story when we could have been given something with so much more depth from Danny's viewpoint. If that was made into a prequel I'd buy it in a heartbeat! Another of my first reads books. I don't usually read books like this, a young adult, contemporary novel. This is really well written, with good solid characters. Troublemakers is the story of a young girl Alena, who has been brought up by her older brother and his partner Nick, as she finds out about her upbringing, her mother and the details as to how she got in the position she is currently living in. Growing up is hard anyway but add politics and a few other factors can make it quite unbearab Another of my first reads books. Absolutely adored this! Now I didn’t really know what to expect when I bought this but I know that I’d seen a lot of buzz about it at YALC last year. Picked it up and read it on a bit of a whim really. So pleased I did. Incredibly emotive and a real page turner. So many themes but all of them explored brilliantly. (Sometimes too many plot points and key themes ruin a book in my opinion) Really did not want to stop reading and wanted to know where it was going throughout. It felt incredibly realis Absolutely adored this! Now I didn’t really know what to expect when I bought this but I know that I’d seen a lot of buzz about it at YALC last year. Picked it up and read it on a bit of a whim really. So pleased I did. Incredibly emotive and a real page turner. So many themes but all of them explored brilliantly. (Sometimes too many plot points and key themes ruin a book in my opinion) Really did not want to stop reading and wanted to know where it was going throughout. It felt incredibly realistic almost like a memoir. Ik las Onruststokers, de Nederlandse vertaling die nog niet is verschenen en nog niet op Goodreads staat (verschijnt in november bij Lemniscaat!). Komende week vind je op Hebban.nl mijn oordeel: is dit boek hot or not? 3.5, was kinda bland but i enjoyed it. A junk food book, you know its rubbish but you want to keep reading. Oh, this book is so frustrating! I wish an editor had taken a large and exceedingly sharp knife to the first third and then I could give it a better rating because there was lots to like. To explain this in more detail: I almost gave up on Troublemakers. The first third of the book is very, very slow, not too interesting and contains some considerable repetition - Alena's life, family and friendships could have been conveyed a lot more succinctly. Instead there are endless scenes showing Danny an Oh, this book is so frustrating! I wish an editor had taken a large and exceedingly sharp knife to the first third and then I could give it a better rating because there was lots to like. To explain this in more detail: I almost gave up on Troublemakers. The first third of the book is very, very slow, not too interesting and contains some considerable repetition - Alena's life, family and friendships could have been conveyed a lot more succinctly. Instead there are endless scenes showing Danny and Nick arguing - which, again, could have been established in a less laboured manner - and a lot of sections which scream "scene setting!". There didn't feel to me like sufficient hook to keep reading - fortunately I was interested due to some reviews I had read previously so persevered. The writing very much screams first novel, too - again, there's a lot of repetition and many sections are just too dialogue heavy (and this comes from someone who loves dialogue). I think Barter is trying to be realistic in her dialogue, but many conversations end up being over-long because of this. There's even several instances of the same word being used twice in a sentence. This is nothing a decent editor couldn't fix, if they took the time, and axing some earlier padding would allow more space to explore the parts of the book that are interesting, such as politics. I liked that the book was political - but I wanted more. There could have been space to at least mention some of the social issues that exist in the East End - it's hinted that the bomber might be a white supremicist, but that's as far as it goes. A lot could have been included without the book becoming too heavy or preachy. Troublemakers is also a peculiar book in that the separate plot strands - Alena and her mother, Danny and his new job with Jacob Carlisle and the East End Bomber - never gelled together quite enough for the book to feel wedded together. I feel like there was too much focus on Danny's new job - Carlisle only appears once - when the interesting things actually happen in the fallout after Alena visits the office. I didn't feel the character of Ollie added to the plot at all. In a book that feels overlong as it is, he could easily be cut - or made more relevant. The friction he causes between Alena and Teagan comes to nothing, too. This is sounding very negative but I'm frustrated because Troublemakers gave me a lot to like, especially in the second half- Alena's voice, while sometimes too chatty for my tastes, was compelling, and I liked her family dynamic with Danny and Nick, which was very well done. I also liked the coffee shops, the way Alena's actions are heedless and frustrating but always understandable, and by and large the adults behaved in a responsible manner (Lynn calling Danny rather than answering Alena's email) - which often they don't in YA fiction! Here aresome reasons why I fell in love with this book! 1) I now want to have my own hipster, vegan, socially aware cafe, where I make speeches about fair trade bananas. 3) The family dynamic was spot on, in soo many Here aresome reasons why I fell in love with this book! 3) The family dynamic was spot on, in soo many other Contemporaries, the parents are bland, banal, 2D characters that fade into the background. However, Nick and Danny are intrinsically complex and flawed in their decisions, which allowed me to picture them as real people. Without a doubt I can picture my own parents as Nick and Danny. My father is definitely a Nick, a textbook dreamer imbued with a sense of realism. 5) And I don't know about you, but I DID NOT predict the ending, I was convinced that Heather had moved to the amazon to protest against its destruction or something, and that her death was a rouse to protect Alena. Alena never knew her political activist mother, who died when she was a baby. She has been looked after by her older half-brother Danny and his boyfriend Nick. They've acted like parents to Alena. When someone starts leaving bombs around London, the atmosphere and area are precarious. It is in this fearful situation that Alena starts to learn about her activist mother which causes tension at home, especially when Danny starts working for a controversial politician, which also causes problems between him and his boyfriend. I thought Troublemakers was an okay read. I've been meaning to read UKYA a bit more for a while now, and when I saw this on NetGalley I was intrigued. I did enjoy it, but it didn't really have anything that actually WOW'd me. Troublemakers takes places in the East End of London, which I've heard is known for its poverty. Therefore, I feel like an opportunity was wasted to really discuss social issues and problems surrounding poverty and the working class of Britain. Poverty is really underrepresented in YA, especially UKYA and I do feel slightly let down that a book about Politics really doesn't seem to actually discuss politics much at all, especially in terms of the working class and social awareness etc. I did enjoy the discussions it had about the system of politics. How people are becoming disengaged, and about the morality and integrity surrounding politics and political campaigns, which was an enjoyable aspect. I did enjoy Alena as a protagonist. She was bratty, and angry, and argumentative, but also a realistic 15-year-old. She had some really good development throughout the book, learning about her past and her mother. I loved the sibling relationship between Alena and Danny, but Danny himself did grate on my nerves sometimes with how protective and dishonest he was sometimes. But their relationship was developed and complex and had some really good moving moments. I also really loved Nick and his relationship with Alena. He was a really good parental figure and I loved how kind and compassionate he was. My favourite thing about Troublemakers was definitely the relationships and watching them evolve, especially when Danny and Nick realised that Alena is not a child anymore, but a teenager who is curious and stubborn. Why did I pick this book up? The cover really drew me in. I do love yellow. I bloody loved it. This book was fantastic. It was entertaining, it was heartfelt, it was clever. I did think this book was going to be something else when I picked it up and read the description but I was so pleased with the overall narrative. I loved all of the main characters, Taegan, Alena, Ollie, Danny, Nick. They all were such complex characters with diverse backstories and different perspectives on the world. While I didn’t always agree with the choices Alena was making, I understood her motivations as they were always clearly laid out in the text. What was fantastic about this book was that the motivations of the other characters were also apparent, something I found very impressive in a first person narrative. Again, you didn’t have to agree with every single choice every single character made, but you could appreciate and understand how those particular people had come to that decision. I was thoroughly entertained by this book. I thought about it a lot when I wasn’t reading it and hurried home from work one night to finish it. I just wanted to read it all in one go and savour it at the same time. I didn’t feel like there was a low point of the book and it just flew by. It was wonderfully written and dealt with a lot of complex ideas. How could I use it in my teaching? I will definitely be recommending it to my older students. Did it have good representation? It did. I liked that Danny and Nick were gay, but it was a fact about them, not a huge part of their personalities. They were so much more than just gay and that was awesome. I feel bad for giving it a pretty low rating when majority of those who read the book seem to enjoy it. The story revolves around 15-year-old Alena Kennedy. Lena's brother, Danny, has been her guardian, alongside his partner, Nick, eversince their mother passed away when she was three-years-old. Overall, I found the plot to be very draggy, especially in the first quarter. Later in the story, tension starts to rise between the characters but that was it. The ending was abrupt and rushed (Or maybe I feel bad for giving it a pretty low rating when majority of those who read the book seem to enjoy it. The story revolves around 15-year-old Alena Kennedy. Lena's brother, Danny, has been her guardian, alongside his partner, Nick, eversince their mother passed away when she was three-years-old. Overall, I found the plot to be very draggy, especially in the first quarter. Later in the story, tension starts to rise between the characters but that was it. The ending was abrupt and rushed (Or maybe it's just me). In all honesty, I was not able to connect with Lena. I found her to be very frustrating and bratty. She had this 'My needs and emotions are more important than yours.' The way she treated Danny was straight up rude. She can not be trusted with emails like the Will and Jacob incident. Like????? Did she not think about it? The impact of it? She had to do what's ~~~~ morally right ~~~~~ It would have taken her like two minutes to call her brother like "Uh. Hi. Just to let you know that we're still continuing this argument like I'm still mad but I think your boss is lowkey shady." Sometimes when I read her intentions or motivations that causes her to act a certain way, I cannot comprehend how she thought it was okay - like how she didn't possibly wonder that she had done had the possibly of her brother to lose his job. Like, she's fifteen! When I was fifteen, I didn't go snooping around people's business - I wanted to marry Logan Henderson. ANYWAY - the ending was unsatisfying since the beginning portion had taken up alot of time that the buildup had lost its impact and suspense. So, when all have been revealed, it didn't feel rewarding. It didn't really answer the questions that were running around in my head. Why was Lena excused for her negative and frustrating behaviour? What about Colombia and Nick? WHAT WAS THE POINT OF OLLIE? I'm being too picky about this but it was alot to take it and in the end, it still left me empty. Again, if you enjoy the book, that is great. Maybe I missed the symbolism or subtext of the story or I didn't get the characters fully. Maybe I'm missing something. I won this book in a Goodreads giveaway and I'm very glad I did as it is probably not something I would have read otherwise. It was very refreshing to read a young adult contemporary that didn't focus on romance and instead explored politics and people's morality in regards to it. I also enjoyed the unconventional family dynamic as I think it is important for teenagers to read about families that don't conform with what is considered "normal". Overall I throughly enjoyed the book and found myself I won this book in a Goodreads giveaway and I'm very glad I did as it is probably not something I would have read otherwise. Although I think its best going into this barely knowing anything and just letting yourself be sucked in and carried away by this amazing story, this book follows 15 year old Alena Kennedy who’s been raised by her older brother Danny and his boyfriend Nick since her mother died when she was just 3 years old. This is a well written, coming of age story following Alena as she begins to figure things out in her life, like her political beliefs, the numerous questions she has about her political activist mother who she has no memories of, and the fact that there’s a bomber going around leaving bombs at supermarkets around London. I had such a great time reading this, it was really well written, simple and easy to follow and yet very entertaining, not boring in the slightest, Alena was a great narrator, she had such a personality to her and I loved reading from her point of view. This was funny, entertaining and really made me think. I’m around the same age as Alena, I’m also paying closer attention to what’s going on in the world trying to figure out where I stand on things and what I think. With the added aspect of a bomber in this book and what’s going on in our cruel and crazy world really connected with me too. I loved the representation in this book too, Catherine Barter wrote a very realistic couple with Nick and Danny, she treat them just like any other couple who fought, made cheesy jokes but there was still the added aspect of people asking questions about who Alena’s parents where and people did still whisper behind her back which was also realistic because that does still happen. It's taken me a while to figure out how to write this review. I loved Troublemakers but I didn't know how to write about it. It's a curious thing, sort of not quite what I expected it to be and somehow more than that. It's a big book. It's thick and edible and layered with a thousand different notes, and all of them hook into you and don't let you go. I loved it. I don't know how to write about it, so maybe I'll try and give you something different than my normal reviews. But let's begin with the It's taken me a while to figure out how to write this review. I loved Troublemakers but I didn't know how to write about it. It's a curious thing, sort of not quite what I expected it to be and somehow more than that. It's a big book. It's thick and edible and layered with a thousand different notes, and all of them hook into you and don't let you go. I loved it. I don't know how to write about it, so maybe I'll try and give you something different than my normal reviews. But let's begin with the blurb. Alena lives with her half-brother, Danny, and his boyfriend, in the east end of London. She has never known her mother who died when she was a baby. Danny and Nick are her family. Danny, though, has taken a job with a local politician who's aiming to be London Mayor; somebody is terrorising the local area by leaving bombs in supermarkets, and Alena's suddenly desperate to know more about her past. Her family. This is a coming of age story, and it's a yell into the world, that moment when you walk to the edge of the beach, dip your toes in the sea and yell out into the blue beyond that you are here that you matter that you exist. Troublemakers is an affirmation; a defiance, but it's also somehow more than that. It's like Sunday Lunch with the people you love, those lunches where you know everything almost a moment before it happens because you know these people. It's about family, forgiveness, foolishness, love. The shape of people. The mistakes of people. The love. The cup of tea, the feet up on the sofa, the recognition of what makes you you. It's a little bit Jenny Downham, a little bit Annabel Pitcher, but it's very much itself. It's feelings, and fear and friendships. Coffee. Hope. Hate. Joy.. I still don't know how to write about this book, but oh I know how to write about what it made me feel. This wasn't at all what I was expecting. Which isn't a bad thing, but it was a surprise! Troublemakers is essentially a book about people, families, lies and fear of the unknown (and maybe a little bit of fear of what you do know). There is a bomber in Alena's hometown planting explosives in supermarkets. There's also some generally rubbish people creating hate crimes and vandalism as you go through. But most of all there is Alena's family dynamic, which is full of secrets, and Alena wants some This wasn't at all what I was expecting. Which isn't a bad thing, but it was a surprise! Troublemakers is essentially a book about people, families, lies and fear of the unknown (and maybe a little bit of fear of what you do know). There is a bomber in Alena's hometown planting explosives in supermarkets. There's also some generally rubbish people creating hate crimes and vandalism as you go through. But most of all there is Alena's family dynamic, which is full of secrets, and Alena wants some answers. Her mother died when she was three, and Alena can't remember anything about her so she desperately tries to get information from her brother, and guardian, Danny and his boyfriend Nick. Usually to no avail; Danny is a closed book about it all. The story builds and builds as Alena begins to unravel the truth about her family. I was expecting the story to have a massive climax, particularly given the bomber running around. But actually, although we got the answers to Alena's past, it was really quite straightforward. No massive ending, no action-packed bomb of someone Alena knows, which is kind of what I thought might happen. And so whilst this at first felt a little bit of an anti-climax, actually I think there's something really clever about this story. I didn't know what I was going to find out, it didn't go the way I imagined, but it did open my eyes to some of the harsher realities of politics. This is an interesting book, largely about people, and so it isn't the most gripping. But it is an honest and frank depiction of what the average person probably sees throughout their routine lives. I like that it isn't hugely eventful and this it is brave enough to just be ordinary. It's also the first book I've read from this genre which dares to consider political influences and the impact these have on everyday people. A thought-provoking book; definitely worth a read. I absolutely loved this book. It is definitely unlike any YA I have read before - Troublemakers has such a unique storyline and a distinctive, relatable voice. I loved the character of Alena and I thought she was so well written and a very realistic teenager character. She is intelligent and thoughtful and determined; YA should have more female characters like Alena. This is not only an incredibly interesting but also a very different and diverse book. I have never read a book with a sister/brot I absolutely loved this book. It is definitely unlike any YA I have read before - Troublemakers has such a unique storyline and a distinctive, relatable voice. I loved the character of Alena and I thought she was so well written and a very realistic teenager character. She is intelligent and thoughtful and determined; YA should have more female characters like Alena. This is not only an incredibly interesting but also a very different and diverse book. I have never read a book with a sister/brother sort of parent relationship, and although this is shocking, I don't think I've read a book featuring a gay couple as some of the principle characters. All of the characters were so well-rounded, interesting, but also intensely realistic. They're the kind of characters who you could imagine living just down your road. The writing style and the dialogue were probably my favourite parts of the book. Barter writes in such a fresh, contemporary, uncomplicated way. The dialogue really helped me imagine the characters and feel more connected to them. Troublemakers is a distinctly modern book that tackles many of the social and political issues that concern us today. I love it how a YA book isn't afraid to tackle and explore these issues from a teenager's perspective. Also the feminist history was something I really enjoyed reading about, and it will definitely inspire readers who have not come across the Greenham Common women to go off and research and find out more about them. After reading the story I have no idea why it is called troublemakers. It gives the impression of a mischievous gang causing havoc. But does it portray the story? No, it really doesn’t. It portrays another story, one related but distant. Lena’s story needs her own title. Troublemakers is one of those books I have been hearing about for a long time, and looked forward to reading. I eventually managed to read it a few weeks ago, and I absolutely adored it – the writing, the characters, the plot. This book is totally FAB. I thought that Alena was really well characterised – I was her age not too long ago, and I thought she was written in such a realistic way. She had just the right amount of angsty-teenager and annoying-younger-sister to make her seem like a real fi Troublemakers is one of those books I have been hearing about for a long time, and looked forward to reading. I eventually managed to read it a few weeks ago, and I absolutely adored it – the writing, the characters, the plot. This book is totally FAB. I thought that Alena was really well characterised – I was her age not too long ago, and I thought she was written in such a realistic way. She had just the right amount of angsty-teenager and annoying-younger-sister to make her seem like a real fifteen-year-old, but not so much that she became annoying. This was so lovely to read, as I think that often teenagers are portrayed as a little too mature in YA. I loved Nick, and whilst I know he’s supposed to be slightly too good to be true, I thought he was wonderful and it broke my heart a bit every time Danny or Alena doubted him. I didn’t like Danny at first, but by the end of the book it is clear the story of his grief is being told alongside Alena’s story, and I thought he was a really complex and well-written character. I found this theme of grief very interesting, especially as it manifested itself so differently in both Danny and Alena. Family was also such an important part of this book, and I loved how Danny, Nick and Alena are shown to be a whole, loving family.